This giveaway has expired. You can find more great giveaways here! The sponsor for this giveaway: Jenn’s Blah Blah Blog. Not long after Jenn has a decided to get the ball rolling with Pink Ninja her wonderful friends Raegan from Contest for That, and Bobbie from Dishin’ with Rebelle joined the fun. Together we make one pretty awesome team, connecting great bloggers with fabulous brands. If you’re a brand looking for help with your brands campaign, be sure to check out Pink Ninja Media. You’ll find some of the best bloggers in the blogosphere to help you with your blogs campaign. Maggies Bags When it comes to keeping her promise to being green, nobody does it better than Maggies Bags! Maggies Bags uses genuine automotive seat belt webbing that’s used to protect you while driving. She uses the high-quality material and turns it into something beautiful that’s eco-friendly. She creates the lovely bags you’ll find at Maggies Bags. Maggies Bags have been featured on TV, in print and online. You’ll never find another handbag as unique and eco-friendly as Maggies Bags. Maggie Bags has an awesome discount set up… Don’t want to wait, will these fabulous bags make an amazing gift for you ore someone you care about? Maggie Bags is offering 25% OFF their Premier Line! It’s valid through Dec. 16, 2012! To get the awesome 25% DISCOUNT ENTER CODE WhatChaWant Ball + Chain Ball + Chain allows members to name their prize on jewelry & accessories. Ball + Chain jewelry and accessories are available for purchase every Jewelry + accessory auction held every Tues. at 8pm CST via their Facebook Page. Join them now as they have some pretty awesome plans to expand their website into an amazing online boutique. You’re going to want to “Like” their Facebook page to stay up to date with some of the best deals and steals around. About Aloha Vintage Jewels If you’re looking for amazing Vintage Jewelry from Circa 1950 to 1980 you’re going to love Aloha Vintage Jewels. 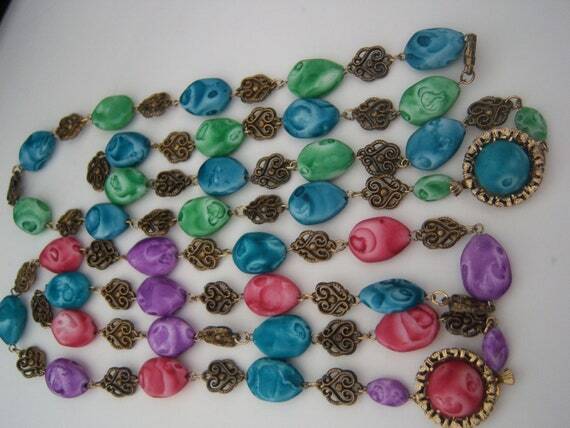 There’s some fabulous, unique, and super original pieces of jewelry at Aloha Vintage Jewels. Jewelry has never been owned or worn. It’s been in stock since the 80s. You’re going to want to follow Aloha Vintage Jewels via Facebook for their Monthly Giveaways, and fabulous jewelry Here are the prizes! $200 Winner’s Choice to Maggie Bags – Winner chooses any product from Maggie Bags valued up to $200. $100 Winner’s Choice to Maggie Bags – Winner Chooses any product from Maggie Bags valued up to $100. $50 Winner’s Choice to Aloha Vintage Jewels – Winner chooses anything from Aloah Vintage Jewels valued up to $50. $50 Amazon Gift Card – Winner will have additional choices depending upon where winner lives. This Christmas giveaway will run from 11/10/12 at 12:01am EST till 12/11/2012 at 12:01am EST. You must be 18 or older to enter, and the event is open Worldwide. For full rules on giveaway, please visit Jenn’s Blah Blah Blog. Disclosure: I was not compensated in any way for this event, nor am I responsible for shipping prize to winner. This giveaway has expired. You can find more great giveaways here! My favorite part is time with my family! My favorite thing about Christmas this year will be celebrating with JUST my husband. Every other year it’s crazy and we drive to 23423 people’s homes. This year, just us! I really enjoy our annual christmas eve party with our friends and family. Now that we all have our own families, this is one of the few times a year that we all get a chance to spend it together! My favorite thing about the holidays is seeing the excitment in my children! I love everything about Christmas!!! i like the LeConte Messenger in black. i love being with family watching a christmas story! Spending time with family that I don’t normally get to see throughout the year, eating fantastic food and seeing the kids enjoy themselves. I love setting up the Christmas tree!! My favorite thing about Christmas is seeing my kids open their gifts on Christmas morning. My favorite thing about Christmas is my mom’s potato soup at midnight on Christmas Eve. My favorite memory was my grandfather putting Christmas presents in envelopes from the oldest to the youngest grandchild. I love spending time with my extended family on Christmas. I absolutely love putting up our Christmas tree…it seems to put everyone in a good mood at our house! I would love the messenger bag at Maggie’s bags! Ready for spending time with the family! One of my favorite things is Christmas Eve dinner with the entire family. I love hearing Christmas music every year. It’s already playing in some stores and I love it! !